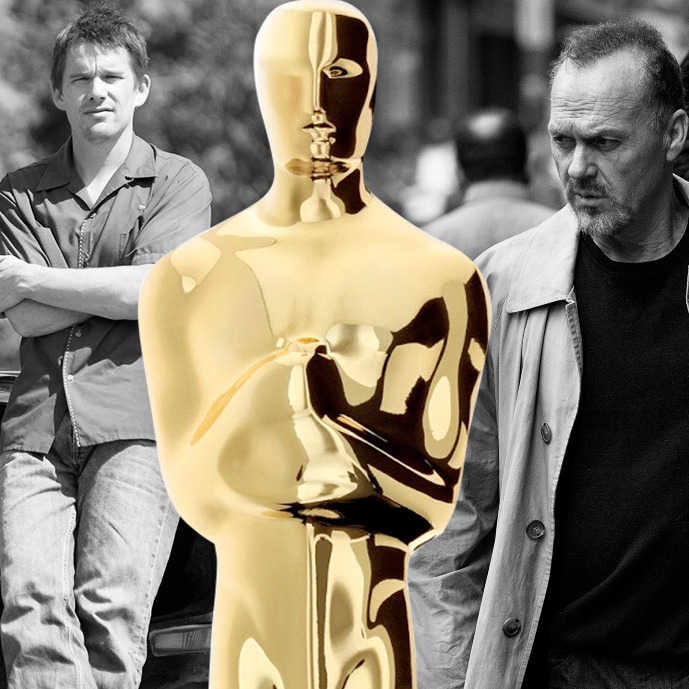 Final Oscar Predictions: Birdman or Boyhood? Shortly after the Oscar nominations were announced last month, I made my preliminary picks for who would win, smirking all the while that these early front-runners would surely cruise to their coronation. Perhaps I got too far ahead of myself. Some of those top picks have since faltered, while dark horses and surging contenders have emerged even in the most surprising categories. I’ve got a humble pie cooling on the windowsill, then, as I make this list of my final Oscar predictions: While I’m fairly certain of my picks, I must admit that there are some races that will remain unsettled all the way up until Sunday night. Keep my predictions in mind while filling out your Oscar pool, but know that this year there are likely to be some big surprises. A mere month ago, Boyhood looked to have this category all sewn up, and then Birdman stormed the stage at the PGA, SAG, and DGA awards, taking each top prize. It’s hard to deny that kind of across-the-board guild support, and so I cast my vote for Birdman, even though there are plenty of factors here that give me pause, including the surge of American Sniper, the likelihood that Boyhood will be boosted by the preferential voting in this category, and the feeling that Birdman’s recent ascendancy has instigated a minor backlash. Still, it’s kind of fun to go into Oscar night with some major races still in doubt! Since the Academy has lately been so partial to Picture/Director splits, there’s a chance that Boyhood helmer Richard Linklater could still pull out a win here, even if Birdman takes Best Picture. But when those splits do occur, they tend to favor the director with the more showy technical achievement, and I think that gives Alejandro González Iñárritu the edge for his audacious “single take” approach to Birdman (though Linklater’s 12-year Boyhood shoot is no small potatoes, either). For some pundits, the uncertainty over this year’s Oscar field extends even to the Best Actor category, where Bradley Cooper feels like a late-breaking threat and Michael Keaton could benefit if Birdman runs the table. Still, the voters I’ve talked to are all still gaga for Eddie Redmayne. If any race could have used some excitement, it’s this one, which has been locked for Julianne Moore since September. The Birdman ascendancy hasn’t seemed to spur more talk for Edward Norton, so I don’t think J.K. Simmons has anything to worry about here. Duh, it’s Patricia Arquette. Sorry, not all of these can be close calls! This race likely comes down to The Imitation Game and Whiplash, and while younger voters love the latter (the under-40 set includes the only people I’ve talked to who are voting for Whiplash to take Best Picture), they’re far outnumbered by the older conservatives who will seize this moment to reward The Imitation Game. Though I’d love an upset victory for Nightcrawler, the tea leaves are arranged just so to indicate a Wes Anderson win for The Grand Budapest Hotel. His movie is also poised to clean up in the craft categories, but this is the best chance to honor Anderson himself, who has been nominated for Best Original Screenplay three times and never won. Don’t count out the riotous Wild Tales, but the finely composed Ida is this category’s front-runner. It helps, too, that the movie appears elsewhere on the ballot, thanks to its immaculate black-and-white cinematography. While the Academy often favors the crowd-pleasing pick in this category, it’s the chilly but galvanizing Edward Snowden doc Citizenfour that has all the momentum. For neither rushing or dragging, the precise rhythms of Whiplash will ensure a victory here. Can the Academy really survive snubbing Selma twice? Voters will likely consider a trophy for “Glory” their make-good, although there’s strong competition in this category, including The Lego Movie’s delicious theme song and Glen Campbell’s moving tune. I’m going with Globes winner Jóhann Jóhannsson for The Theory of Everything, but that Grand Budapest Hotel score could be a spoiler if voters keep checking the movie’s ballot boxes. This looks to be a twofer for Birdman director of photography Emmanuel Lubezki, who won just last year for Gravity. Again, though, I feel like Grand Budapest’s below-the-line dominance could extend into this category, especially now that the Academy has finally cottoned to Wes Anderson’s never-before-nominated cinematographer Robert Yeoman. The Grand Budapest Hotel has the most pop, zip, and verve in this category, and it’s also the only contender from a film nominated for Best Picture. It’ll win. I go back and forth on this one, kids. Grand Budapest, again, is a safe consensus pick in all of these craft categories. Still, it’s hard to deny the breadth and invention of the alien races showcased in Guardians of the Galaxy. Today, I’m picking the latter, but ask me again on Sunday and I may have changed my mind. When the thing you production-designed is right there in the title, how can you not vote for The Grand Budapest Hotel? War movies do well in the sound categories, favoring Best Picture nominee American Sniper. For the last scene alone, I think Whiplash takes it. But again, a double win for American Sniper would not surprise me. Can Andy Serkis’s groundbreaking, motion-captured Apes performance finally win the Oscar it’s warranted? I feel like the strongly reviewed sequel faded from memory a bit too quickly, ceding this race to Guardians of the Galaxy and likely winner Interstellar. It infuriates me that the Oscarcast still wastes time on three (THREE!) short-film categories in the age of YouTube, when these tiny, often-unremarkable shorts launch themselves into the Oscar race just by renting out a block of time at, say, the Nuart in Los Angeles. Nevertheless, I don’t want you to lose your Oscar pool, so pick The Phone Call. Unless the voters are suddenly gripped by anti-Disney hysteria, they’ll vote her to reward Feast, the only goddamn short they might have actually seen in a theater (since it was attached to Big Hero 6). Memo to the Academy: We no longer live in an era where most feature films are preceded by shorts! Cut these categories, I’m begging you! Pick Crisis Hotline. You’re welcome.